Danube is the largest river in Europe, crossing 4 countries and over 2000 kilometers. We decided to take the boat through the Wachu valley from Spletz to Melk, the wine country of Austria. 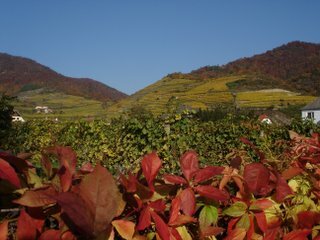 Vineyards lay across the hills in straight lines with leaves of yellow, orange and red traversing the hillsides like a crossword puzzle. The sun glistens off the fast flowing river as we move down the Danube. The straight rows of vines set below the barrage of the orange forest and above the shores of the fast flowing Danube River provide a picture of the perfect fall day, unlike any we ever see in California. The beautiful colors remind me of the fabulous fall fashion in the shop windows of Vienna. You could picture the designers choosing their palates from the nature of autumn.BaroqueUpon visiting the Melk Abbey in Austria, we finally learned what Baroque truly is. Zoe-Pascale after listening to the tour guide summarized the Baroque period as the following. �When you look at a mirror, it doesn�t matter if you can see well in the mirror, what matters is that the frame itself is so beautiful that is what you want to see.� It�s all about presentation versus substance.